HomeBusinessElectric cars: What if you live in a flat? February 17, 2018 Paul Business Comments Off on Electric cars: What if you live in a flat? In the street where I live no one yet owns an electric car – because there are no driveways on which to charge them. Indeed nearly a third of car-owners in the UK have no off-street parking, as they live in a flat or a terraced house. Public charge points are not always an option either; even in big cities the nearest facility can often be a 20-minute walk away. It is a problem the government is doing its best to tackle, but the pace of change is slow. In the meantime the worry is that the electric car revolution could by-pass millions of people, particularly in the inner cities. But there are some things that flat-dwellers can do to make owning an electric vehicle (EV) practical. One option is to ask your local authority to install a charge point in your street. The government’s Office for Low Emission Vehicles (OLEV) has set aside £4.5m to support such applications over the next two years. OLEV will pay up to 75% of the costs of installation, to a maximum of £7,500. That leaves councils having to find just 25% of the costs. Is there a charge point near me? Click here to find your nearest charge point. However, since 2016, only five local authorities have applied for money from the scheme: Portsmouth, Kensington and Chelsea, Cambridge, Luton and Kettering. Together they have installed just 50 charging points between them. As a result the government has written to all local councils, telling them there is plenty of money in the pot, and they should use it. “Millions of homes in the UK do not have off-street parking, so this funding is important to help local councils ensure that all their residents can take advantage of this revolution,” said a frustrated transport minister, Jesse Norman. However some cash-short local authorities are still concerned about the cost, as well as having to clutter up streets with dedicated parking places. Thanks to government subsidies, more and more employers are installing charge points at work. By 2022, half the firms that have car parks are expected to have at least one charging facility. Matthew Thomason, who lives in a flat in Nottingham, has been able to take advantage of such a scheme at Rolls-Royce, where he works as an engineer on the engine that goes into the Airbus A350. 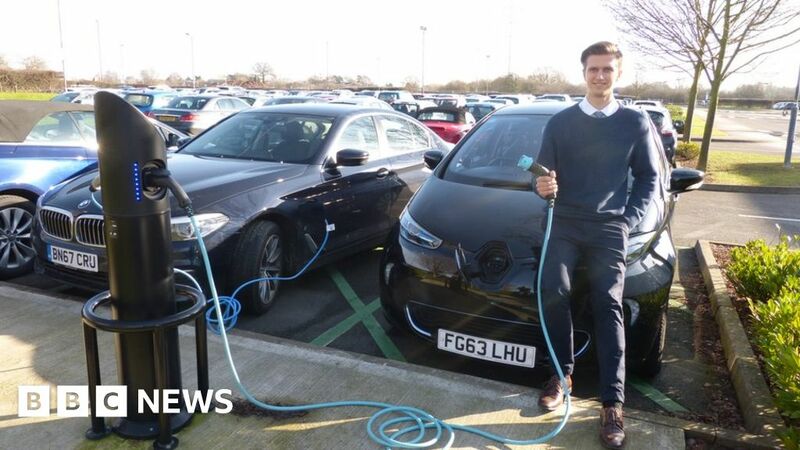 He commutes 17 miles to Derby each day, and charges his Renault Zoe in the car park for around four hours. “It’s just so convenient,” he says. But he thinks many other flat-dwellers still struggle with the charging network. It is the big cities which are most affected by the lack of driveways, and which have a high proportion of flat-dwellers. But it is precisely these areas where electric cars are an effective means to reduce pollution. Four councils in London – Richmond, Hounslow, Westminster and Kensington and Chelsea – have been trialling charge points installed in lamp posts next to parking bays. These may not be as powerful as dedicated fast or rapid charge points, but they are cheaper to install, and do not require additional street furniture. In partnership with OVO energy, Kensington and Chelsea is currently having an extra 50 lamp-post charging points installed, all powered by renewable energy. “Most residents do not have access to off-street parking to charge an electric vehicle,” says Cllr Gerard Hargreaves of Kensington and Chelsea Council. Among the other options are to use public charge points near where you live – or at a supermarket, for example. In total there are now 5244 places to charge your car, around 20% of which are in London. Elsewhere – particularly in rural areas like Wales – coverage is very patchy. But since many charge point locations have several sockets, there are 14,839 “connectors”. However Justin Benson, the UK head of automotive at the consultancy firm KPMG, believes improvements in battery technology will soon change the dynamics of re-charging. Within a couple of years, cars will be made which have a range of up to 300 miles (500km) between charges, double that of current vehicles. So owners will no longer have to charge their cars every night. “If you want to buy an electric vehicle, I wouldn’t discourage someone who lives in a flat,” says Mr Benson. “The main reason being that the average EV driver will soon be re-charging for a 200-300 mile range. He also believes that the biggest thing holding back the adoption of electric cars is not the charging network, but the price of the cars themselves and the lack of a certainty about their value second-hand. The government is adamant that it is doing everything it can to improve the charging network. However, a group of MPs on the Environmental Audit Committee says the government is still not doing enough to encourage drivers to buy low-emission vehicles. And it accused ministers of falling behind on their own targets – namely that “most” cars and vans should be electric by 2030. Last month less than 2% of the vehicles sold in the UK were electric. If that is to change, those who don’t own a drive, or who live in a flat, may need a lot of persuading to buy one.